Beloved mother, grandmother, great-grandmother and friend, Martha Estelle Unruh “Estelle” peacefully passed away at her son Larry’s home in Concord, California on January 13th at the age of 104 just 6 days shy of her 105th birthday. Estelle was born on January 19th, 1914 in Watsonville, CA to James Hopkins and Beatrice Pinto Hopkins. Estelle’s maternal lineage goes back to the 1700’s in the Pajaro Valley. In the 1800’s, her great grandfather Jose Amesti was granted a Spanish land grant in 1823. “Rancho Los Corralitos” was a 15,500 acre Mexican Land grant that extended along Corralitos Creek north of Watsonville, and encompassed present-day Corralitos and Amesti. Her father, James Hopkins, was a strawberry farmer and her mother Beatrice was not only a housewife but also managed a fruit stand on the side of the road in front of the farm. Estelle went to local schools and graduated from Watsonville High School in 1932. 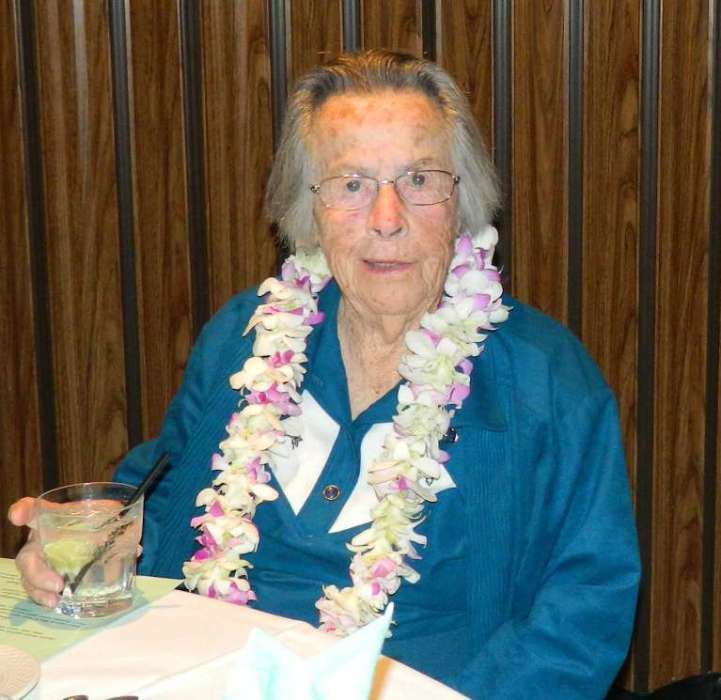 After meeting and marrying her husband Paul Unruh in Watsonville they soon moved to Marin County following his being stationed in the Naval Shipyard during World War II. They also lived in San Francisco during the war and had two children Larry and then Barbara. Following the war they eventually moved back to Watsonville. Estelle and Paul started Coast Collection Services and became respected members of the local community. They had the agency for 30+ years. When her children were young she was also very active in the Mother’s Club of Moreland Notre Dame Academy and when her children grew up was active in Soroptimist International and later in life the Corralitos Woman’s Club. She was an active member of the St. Patrick Church and Holy Eucharist Church parishes. Besides being an active bridge player, she loved going to Reno with friends and playing a fierce game of blackjack. She is preceded in death by her husband Paul Unruh, her brother and sister-in-law George and Kay Hopkins and her daughter and son-in-law Barbara and Ken Gray. She is survived by her son, Larry Unruh (Alfred Gomes) of Concord; and grandchildren, Russell Gray (Kathy Oliver) of Watsonville; Jeff Gray (Mark Frizzell) of San Francisco; Matthew Gray (Melanie) of Normal, Il. She had four great grandchildren. A celebration of her life will be at Holy Eucharist Catholic Community in Corralitos, Tuesday, January 22nd at 11:00 AM. A private family burial will follow at the Pajaro Valley Memorial Park. As an expression of sympathy, memorial donations may be made to a charity of your choice.